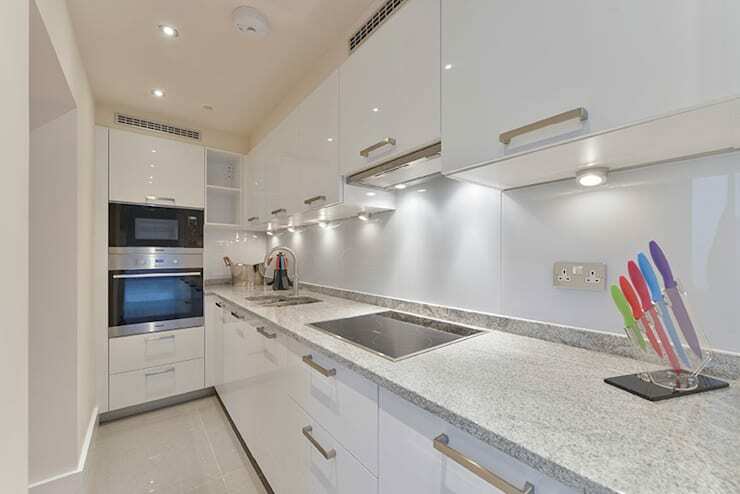 Welcome to Queen’s Gardens in Bayswater, an affluent neighbourhood in West London, close to Hyde Park. A basement apartment here was lying in a very dilapidated condition, with cracks in the walls, drab exposed concrete floors, broken windows and sockets which were hanging out of the walls. 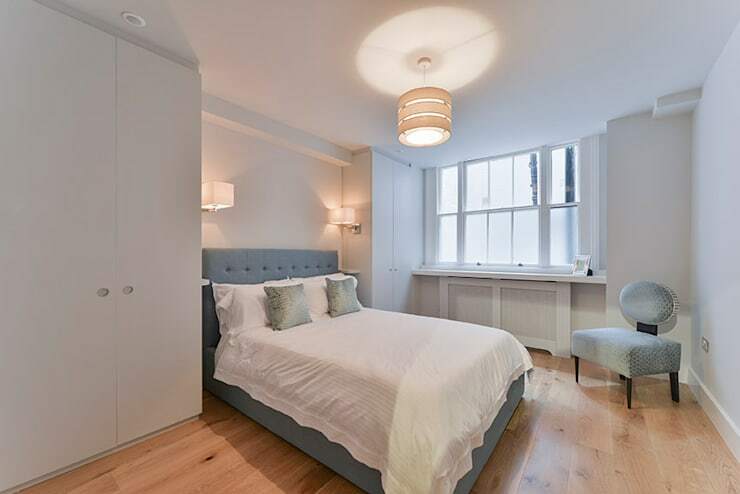 But thanks to the intervention by the home builders at The Lady Builder, the revamped flat now flaunts elegant oak flooring, extensive under-floor heating and in-built ceiling speakers. The lavish use of white, sleek designs and contemporary furnishing has dramatically changed the abode’s look and feel. 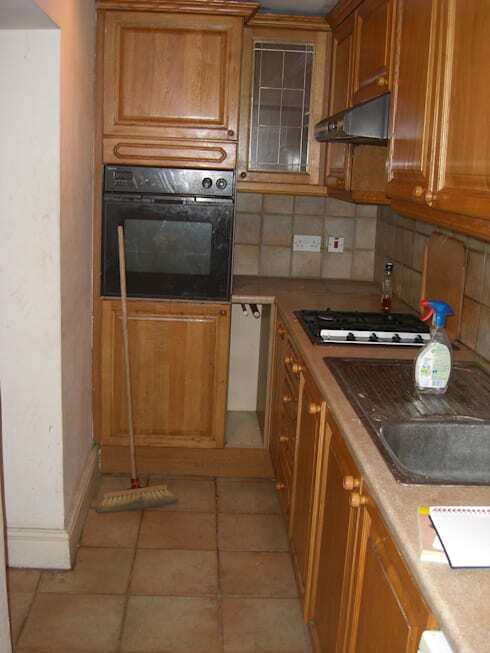 Ridden with old-fashioned dark cabinets, boring fixtures and dingy looking tiles, the kitchen looked sad and uninviting. Look at the stunning transformation now! White dominates the sleek and elegant kitchen, with gleaming and minimalistic cabinets efficiently catering to storage needs. Sleek chrome handles, modish appliances, chic granite countertop and trendy fixtures make this place ideal for cooking up a storm. 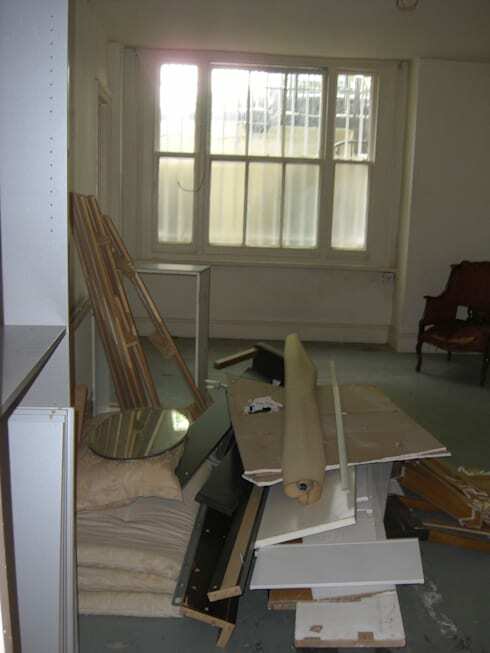 Despite the presence of a large window, the living space looked dull and shabby before. Old furniture and clutter troubled the aesthetics of the space. Elegant and cosy grey couches offer plush seating in the bright and welcoming living area now. 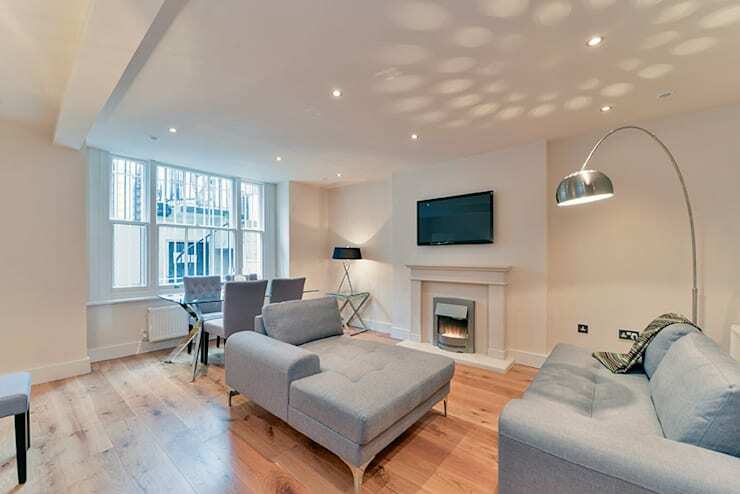 The TV has been mounted above the modern fireplace, while arty lamps and soft recessed lights ensure a soothing ambiance. The large window brings in ample sunlight, while the stylish dining arrangement makes for pleasant mealtimes. 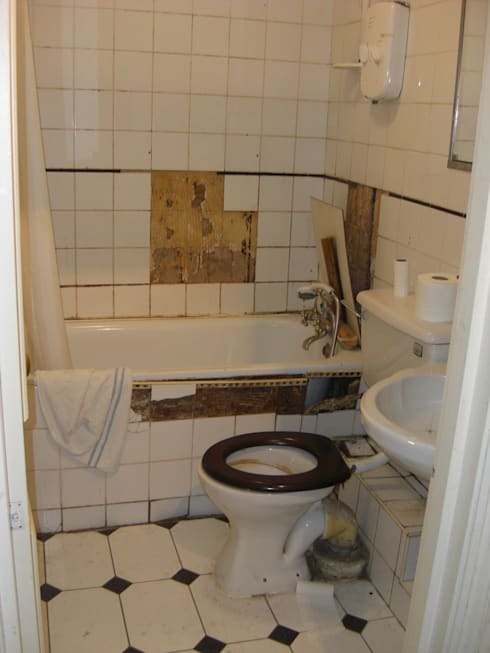 Missing tiles, unsightly grime, and drab and dated fixtures made the bathroom a nightmarish place with hardly any rejuvenation to offer. Large, creamy and gleaming tiles pair with a sleek glass shower panel and a large mirror to make the new bathroom a bright and shining space. Modish sanitary wares glow under the tasteful recessed lights, while the stylish wooden cabinet offers storage as well as contrast in the light-hued space. 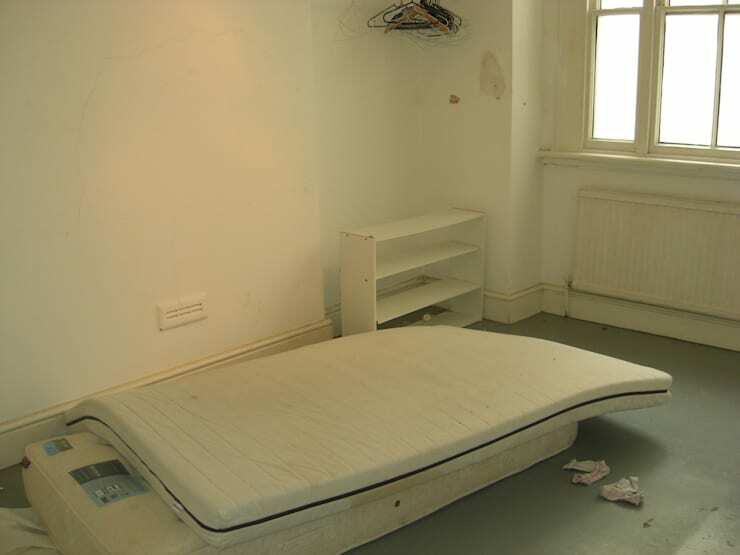 It was impossible to expect a good night’s sleep in this dingy and unappealing bedroom, with its shabby bed, a non-descript shelf and a morose floor. While the wooden floor offers warmth in this elegantly revamped bedroom, the plush white and grey bed promises peaceful relaxation. Sunlight streams in during the daytime through the large window, while chic pendant and sconce lights create a dreamy atmosphere. A large and smooth closet offers oodles of storage space, while a stylish chair near the window makes for a cosy reading spot. Impressed by the transformation of this once dreadful basement apartment? Check out another makeover story for more ideas - A Bright Cheerful Makeover For A Tiny Dark Apartment.